The head of digital imaging for Samsung UK has said that he believes that new products in its camera line-up will see the firm positioned as a leader in the compact system camera market. Samsung was one of the first manufacturers to introduce a mirrorless solution to the market, with the NX10 back at the very beginning of 2010. However, it has never made any serious impact on the market, currently falling behind Panasonic, Sony, Olympus and Nikon in sales rankings. Recently, Samsung introduced three new cameras into its NX line up in the shape of the NX1000, NX20 and NX210F. All contain a 20.3 million pixel sensor and integrated WiFi. Speaking to TechRadar, Nick White said, "In terms of technology, Samsung's NX series offers industry-leading performance by using proprietary optical technology, the sensor being key." Samsung NX cameras use APS-C size sensors, which are larger than those found in Micro Four Thirds cameras manufactured by Olympus and Panasonic and significantly larger than the device found in the Nikon 1 system. 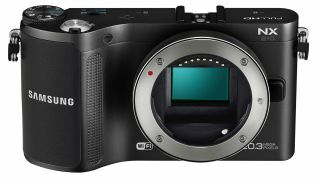 White said that the firm was targeting both compact camera upgraders and DSLR users looking for a second, backup camera. "We will maximise the user experience by effectively leveraging Samsung's consumer electronics experience. Samsung will continue to introduce a wide array of products to assume leadership in the CSC market." Plans are afoot to introduce more cameras and lenses into the NX line-up, but details of how the company intends to oust all of its rivals are not clear.